Tokyo: The governments of Japan and China stressed the importance of free trade and pledged to accelerate negotiations of bilateral pacts at their high-level economic dialogue in Tokyo on Monday, the first such meeting in eight years. "We share the recognition that bringing on a trade war would have a huge impact on the prosperity of the global economy," Japanese Foreign Minister Taro Kono told reporters after the meeting. Kono’s remark came ahead of Japanese Prime Minister Shinzo Abe’s scheduled visit to the US, where he is expected to discuss the issue of trade imbalance with the US President Donald Trump on Tuesday and Wednesday. The two countries also agreed at the ministerial level to accelerate negotiations on a free-trade agreement between Japan, China and South Korea and also on the Regional Comprehensive Economic Partnership, or RCEP, a free-trade pact among 16 countries. The RCEP partners include the 10 members of the Association of Southeast Asian Nations, plus Japan, China, South Korea, India, Australia and New Zealand. After the meeting, Kono, who served as chair, also told reporters that Japan and China agreed to hold another high-level economic dialogue in China as early as next year. Relations between Tokyo and Beijing had soured over the last decade or so mostly because of China’s activities in the East Chin Sea and repeated conflict over the Japan-administered Senkaku Islands, which China claims as Diaoyu. Kono stressed that Japan and China "have enjoyed economic benefits" under a free trade system and said that the two countries agreed to "play a responsible role in the development of the international economy and the resolution of global issues." 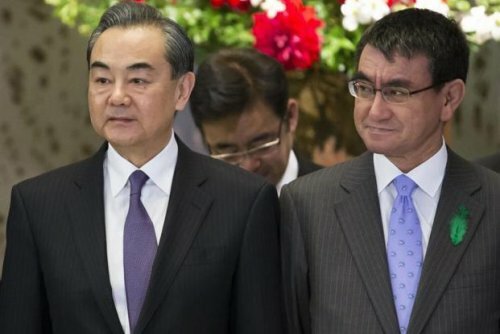 Chinese Foreign Minister Wang Yi said: "As the relationship between China and Japan has improved, we can restart high-level economic dialogue after eight years." Wang pointed out that 2018 marks the 40th anniversary of China’s move to reform and liberalize its economy and markets. He said that the Chinese government will continue to open its economy. Wang said the areas of partnership include environmental protection, the development of high-end manufacturing, the sharing economy, the health care and the nursing industry. "Both countries should foster the Belt and Road Inititiave and promote talks about trilateral FTA of China, Japan and Korea and RCEP. Both sides should be opposed to trade protectionism and encourage the opening up of the world economy," Wang added. Tokyo and Beijing also shared the view on Monday that they should encourage cooperation in third countries for China’s BRI aimed at creating a huge economic zone linking China to Europe by land and sea. Japan said it would support the Chinese economic initiative on condition that the fiscal health of developing countries would be placed first. Kono said that the "free and open Indo-Pacific strategy" pursued by the administration of Prime Minister Shinzo Abe will also contribute to BRI.